Please welcome Michael R. Underwood back to the blog. The first installment of his Genrenaut series, The Shootout Solution, debuts on the 17th, and Michael kindly wrote a guest post about what inspires him the most. Also, Michael has recorded some great choose-your-own-adventure type segments for the Genrenauts series, so be sure to check out the video! When I was in grad school, I wrote my M.A. Thesis about tabletop RPGs. And one of my major facets of research involved reading a bunch of RPGs in the indie gaming movement, RPGs developed by very small or single-person teams, games that re-invented the form. Very quickly, I noticed that indie RPGs made a very specific point to cite their sources, to spell out and directly engage with the games that had come before, the games that inspired their own games or whose systems they were copying directly. Each game had a lineage, the seams were exposed. Games pointed back to Sorcerer, to Dogs in the Vineyard, to Universalis. Quickly, I discovered the games whose influence was so widely and deeply felt, they’d been appointed the progenitors of lineages of design, played and played and modified (aka hacked) until they’d become something new – recognizable, but distinct. That process of influence and iteration didn’t start with the indie RPG movement, but it became more transparent. I loved it. As someone who geeks out on thinking about genres as conversations — as arguments and counter-arguments, synthesis and elaboration — this level of transparency was delightful. Not only because it made tracing design ideas for my research much easier, but because it was so honest, so generous. It was a tradition of giving thanks and acknowledging that each designer was building on the works that had come before. Last year, I discovered Austin Kleon’s books Steal Like an Artist and Show Your Work. In those books, Kleon speaks clearly about acknowledging and respecting influence, of being clear in where you’re taking your ideas. It’s not about trying to get away with anything, it was more about honesty. Reading those books, I was reminded of the indie RPG designers citing their sources and paying homage to the designers that had come before. And so, I told myself that I’d start being even more explicit in citing my sources. I’ve not been coy when it comes to influences, but for Genrenauts, a work that’s very much about genre and narrative conventions, it made all of the sense to include a list of works that inspired each work and the series as a whole. I talked about the works that inspired Genrenauts in the acknowledgements for each novella, but I’ll repeat them here to show what talking about inspiration and influence means to me. There are a few works that loom large, the kinds of works that I see as being direct inputs which my brain re-combined into Genrenauts. First is The Last Action Hero. I haven’t seen the film in decades, but here’s what I took away from the film. Young Mike was delighted and struck by the direct acknowledgement that action movies had their own rules, and that those rules were different from the rules of real life. It was the first work I can remember that directly addressed genre tropes and expectations, and is probably the Mitochondrial Eve of my inspirations for Genrenauts. Next up is Planetary, the Wildstorm comics series created by Warren Ellis and John Cassaday, with colors by Laura Martin. The influence from Planetary is both wide and deep, in different ways. The first major portion of Planetary is a mission of the week structure, where the team investigates a case each issue, traveling between stories inspired by popular fiction genres of the 20th century, from Hong Kong Ghost Story and Kaiju to Pulp Age Superheroes. That tour de force through genre hit me right in the aesthetic, prompting me to think about the way that narrative genres are used culturally, how they are mirrors and prototypes, art imitating life imitating art. More specifically, Genrenauts is informed by Issue #9 of Planetary, called “Planet Fiction,” where a group successfully crosses between dimensions to a fictional world created for the mission itself. And of course, because it’s a Planetary story, things go poorly and need to be sorted out. The group crossing between these worlds were called Fictionauts, a name I had mentally front and center when coming up with the name for the genre-dimension-crossing travelers aka Genrenauts. The third work of my influence trinity is Leverage, the TNT television series created by John Rogers and Chris Downey. In Leverage, a group of thieves decide to turn good and pull heists on bad guys in order to fight for the little guy. Leverage is strongly ensemble-driven, with great character arcs over time and a strong procedural engine of a new mission every week. I love the set-up of Leverage, and the line “Leverage for stories” came about very early in the process of developing the idea of Genrenauts. I decided on a heist-team-style ensemble very early, first more overtly, then obliquely as I moved from thinking about each team member in terms of their Leverage Archetype (Hitter, Hacker, Grifter, Thief, Mastermind) and shifted to thinking about their approaches and specialties within the missions. But even as I drifted away from the archetypes, I kept the optimism, and the commitment to strong procedural storytelling, as well as a focus on fun. 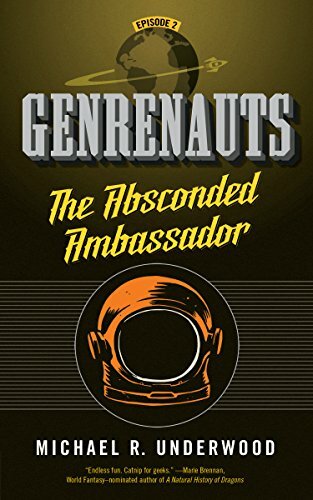 There are many more influences on Genrenauts, especially on individual episodes, but I’ll let the acknowledgements in each novella do the rest of that job. As I wrap up, I want to speak to my fellow storytellers. I have found citing my sources directly to be incredibly liberating, and I invite you to join me, however you feel comfortable. I know that as a reader, when I see that direct citation in other works, it helps me know where the writer was coming from, what they were reacting to. And if I like a work, I can take those citations and trace back through the narrative lineage, comparing the works and seeing what precisely was taken, what was left behind. It’s narrative genealogy and archaeology and folkloristics all at once. It puts works in a broader context, makes it clear how each story is part of one or more conversations, a vast tapestry of stories woven together through time. Leah Tang just died on stage. Well, not literally. Not yet. Leah’s stand-up career isn’t going well. But she understands the power of fiction, and when she’s offered employment with the mysterious Genrenauts Foundation, she soon discovers that literally dying on stage is a hazard of the job! Her first assignment takes her to a Western world. When a cowboy tale slips off its rails, and the outlaws start to win, it’s up to Leah – and the Genrenauts team – to nudge the story back on track and prevent a catastrophe on Earth. 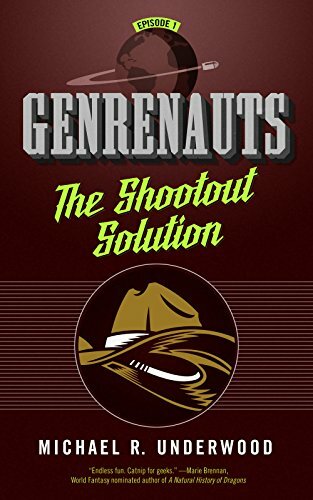 Genrenauts, guest post, michael r underwood, The Shootout Solution.